Note: Be sure to read my post from yesterday at the Commercial Appeal Travel Blog. Imagine a city of millions becoming a ghost town. It’s not a bad idea now and then. Election Day yesterday brought the city to a halt. Voters had already been given days off to travel to their birth places, some seven days walk away. I’ve seen no trains in this country, just ramshackled buses. 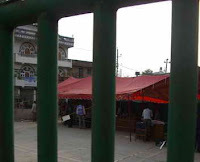 In Kathmandu all vehicles, except police and the official UN observer’s transportation, were closed down for a day. There was silence, except for the crows in the air.. A dults stood in lines at their neighborhood polls but even better poured into the streets and passed a holiday enjoying each other, arguing politics and sharing meals. Groups of sober men (no alcohol allowed) gathered in parks, on stoops, on roof tops, in patios or just in the middle of the street knowing they wouldn’t be knocked into oblivion by some taxi or motorcycle. Women and young girls were constant fashion statements in their bright pinks, turquoise, lime green, and red saris and scarves, their hair and faces perfectly kemp t. Imagine all the gas saved. Imagine the reduction in emissions. Everything was closed except tourist hotels. Now, the citizenship waits two weeks for the results of their votes. As the US is embroiled in its own search for presidential candidates, wouldn’t this be a good reward for all the suffering we go through after the wars are over? A real day off. No traffic literally. Getting together with friends. Today's headlines in The Himalayan said "Nepal shows the way: Polls peaceful, turnout huge." Maybe it works. Jim, my guide, and I had been invited to a Nepali dinner at the home of Sobu who works for American families here. She has saved sufficient money to buy a piece of land and build a three story concrete home in a neighborhood about a block from the French Embassy. Yes, to get there, we had to hike about a half hour, and again on the return in the dark. BUT, the streets were empty of life-threatening vehicles. Rozi, her daughter, wearing the obligatory helmet, had met us on her small bicycle to lead us through the dusty paths and pothole dirt stre ets to the green oasis of their house. It gave me a chance to see how a Buddhist family lives. 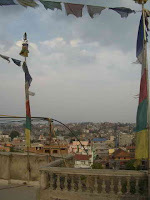 We removed our shoes as an act of respect (my neuropathy didn’t like that), and then Sobu led us up to the roof top where we had a wide view of the city as well as their own dusty strings of prayer flags, which are continually replaced and kept flying. Neighbors from other Buddhist sects hung single prayer flags more like national ones. The most unnerving part was that there was no electricity, a condition most people live with every day. The city decides to shut off the electricity because they claim there isn’t available and it’s costly. Sobu said it’s because there is such an increase in homes and buildings there is not enough to go around. On the second floor was the family altar to Buddha. Offerings are made daily: three bowls of water, four bowls of rice and incense continually burning. Once a year a Lama visits for a day or two and purifies the house, blesses the offerings, and preforms an elaborate prayer ceremony called a Puja. He burns peas, corn, and wheat for good luck and offers the ashes to the five Buddha incarnations. A special bread, chapati made from flour and ghee, is fried in a holy oil. Then everything is shared at a Prasaid festival. These things, Sobu said, are made, then left for God forever but only after you have shared them. It’s poor people sharing with poor people, she said with pride. She also said Buddhists do not kill anything, but they can eat what has been killed by someone else. Dinner was spicy cheetos then dahl, a rice, peanuts, raisins, and beans stew, with a curried mix of broccoli and cauliflower, and a greens dish from spinach, tofu and other loose greens. Homemade yoghurt (from water buffalo milk - really delicious) and fresh fruit was dessert. Then she offered us her homemade Nepali wine fermented from distilled rice each year at Buddha’s birthday, which is any day now. The red spot on the heads of many Buddhist, she explained, is called a Tika and you can do it yourself. It represents good wishes and is most often done in anticipation each year of the the Devwai and Tihar, one of many food festivals where butter lamps are lighted. On a full moon day, she explained, a butter lamp is lit and God is always there to see it. Sobu and her daughter and year old son live in a chaos that she continually apologized for, but knowing that what she does, blesses the Buddha in whom she believes. In the quietness of yesterday, I had rearranged and discovered all the gear needed for trekking. From four bags, I am reduced to one, which the porter will carry along with my backpack. We fly to Pokhara at noon today, spend the night, and set out early on the first trek, through the Annapurna range of mountains, ending up in the Chitwan Jungle. Since there is no chocolate, candies, bread (other than flat breads of the moment, which are delicious), or fresh v egetables edible, I’m wondering how a vegetarian is going to be fit to go. I do have gorp, but some ingredients might melt in the heat. It’s hot. I’m counting on breakfast to sustain me, although I doubt we’ll have such elaborate food on the trail as we’ve had at the Yak and Yeti hotel. I vote for the Dosa for breakfast. 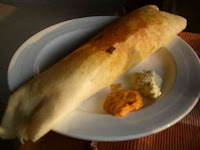 These are large thin crisp pancake like wraps made from a dough of rice flour and lentils. A yellow potato salad called alou is put inside it and it’s served with a unsweeten coconut salsa. But most amazing is the p apaya, a sweet bright kind I haven’t seen since I lived in Tanganyika many moons ago. 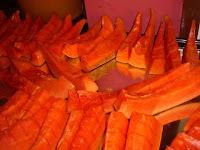 Papaya and pineapple are the most popular fruits. This is the meal that gets me started each day, and now I wonder how we’ll fortify ourselves so generously as we trek. If you wish to follow on a map of Nepal, find Pokhara. We walk to Landrung the second night, then Chhomrong the third, then pass through rhododendron forests to Ghorepani for the fourth night, then down through the 3280 steps (really steps) to Tikhedhungga for the fifth night before hiking downhill to Nayapul where car picks us up to return to Pokhara before setting off for Chitwan. We have also been advised that the Chinese government has closed Tibet until after the Olympics are over in October. No one gets in. Therefore, Jim is hastily making plans for us (after the important trek to the Base Camp of Mt. Everest where I’ll hang our prayer flags) to go to New Delhi, India, and to the city of the Dalai Lama before picking up our scheduled trail in Bhutan the end of May. This is good. I’ve never been to India. 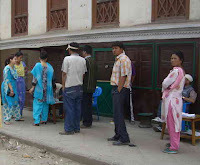 Photos: Waiting in line to vote in Nepal; A voting booth with United Nations observor; From the roof of Sobu's house; Dosa for breakfast and fabulous papaya.